New Mazda MX-5 revealed - all you need to know | What Car? 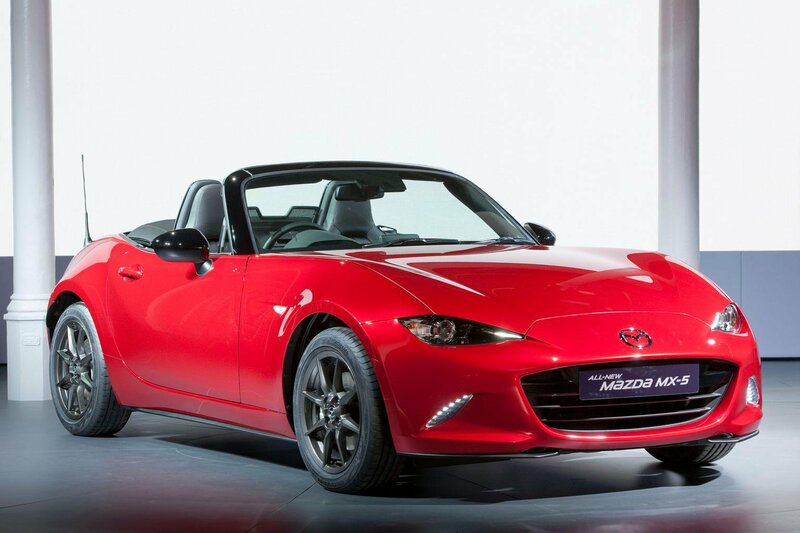 The new 2015 Mazda MX-5 was shown to the public for the first time at the Paris motor show. The all-new car is the fourth generation of the Mazda MX-5, a sports car that has redefined the idea of fun, affordable sports cars during the 25 years that it has been on sale. Despite its different look and all-new architecture, the new Mazda MX-5 retains similar characteristics to its predecessors: it is a lightweight, two-seat, soft-top sportscar with a 50:50 weight distribution and powered through the rear wheels. See exclusive studio photos of the MX-5, as taken by our sister title, Autocar. The Mazda MX-5 driving experience is described by the car’s maker as Jinba Ittai - which roughly expresses the way it brings the driver and car closer together by delivering faithful responses and an enjoyable driving experience. To achieve this, Mazda says it has gone back to basics with the latest MX-5, putting an emphasis on reducing its weight. Insiders acknowledge that the increased size and weight of successive generations of the old car have been detrimental to the driving experience. As such, the latest car has the most compact body of any Mazda MX-5 and is 100kg lighter than the last generation car. Mazda has not revealed the car’s precise weight, but it should be around 1050kg. The new MX-5 is also 10cm shorter than the outgoing car, 2cm lower and just 1cm wider, with a wheelbase that is reduced by 1.5cm. The 50:50 weight distribution was seen by Mazda as critical to creating a car that drove well. To achieve this, Mazda has located the engine closer to the centre of the car than ever before and constructed the bonnet, bootlid and front and rear bumper struts from lightweight aluminium. Mazda also says these lightweight materials have helped lower the MX-5’s centre of gravity, which should enhance the driving experience. The decision to continue with a manual folding cloth roof also helped lower the car’s centre of gravity. The MX-5 has double-wishbone suspension at the front and a multi-link arrangement at the rear. Mazda says the set-up is focused solely on ensuring driving pleasure. For the first time, the steering is electrically assisted. The car unveiled today is on lightweight 16-inch wheels, although Mazda has not officially confirmed wheel sizes that will be available when the car is launched. The only confirmation is that the MX-5 will have a direct-injection 1.5-litre petrol engine linked to a six-speed manual gearbox - as featured in the car on the Paris show stand. This engine is a development of existing a Mazda unit and incorporates the company's unique Skyactiv technology (as used on the Mazda 3 and Mazda 6), which will help it to produce ‘outstanding performance and great fuel economy’. The range is expected to eventually comprise 1.5 and 2.0-litre units producing around 130bhp and 165bhp respectively. An automatic gearbox option is also likely in time. Inside, Mazda says the MX-5 has been sculpted to wrap around the occupants and allow the driver to concentrate on the driving experience. To this end, the seats are set lower than before and the cabin set slightly farther back in the car. The pedals, controls and gauges are also positioned to ensure the driver can always look straight ahead. In addition, the MX-5’s bonnet is lower than before, and the A-pillars and windscreen top are thinner and farther back than before, to give the driver a better view of the road and greater peripheral vision. Mazda has yet to confirm details such as the MX-5’s boot capacity. The company has also confirmed it plans to launch a range of customisation options for the new MX-5. These are expected to range from decals and stickers through to enhanced interior trims. Mazda has yet to release UK pricing for the car, but says ‘maintaining the car’s value proposition as a sportscar… has been important’. Despite this, there have been persistent reports that a price rise over the current entry-level model’s £19,995 is inevitable because of the development costs and added desirability of the new car. As such, an entry-level figure of around £22,000 is likely. Traditionally the MX-5 has not been heavily discounted. Although the sports car market remains small, Britain is likely to be one of the biggest European markets for the car, and demand will mean the current level of discount (around 8%) is unlikely to be matched until at least 12 months after launch. Although Mazda UK has yet to confirm details, the new MX-5 is expected to go on sale around the late summer of 2015.